Eveline Widmer-Schlumpf announced today that she will not seek reelection as a Federal Councillor in December, stepping down from her position as one of the 7-member executive team at the end of this year. 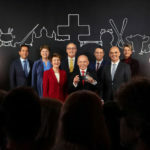 Elected to the Federal Council in 2007, after a coup pushed fellow UDC (SVP) party member Christoph Blocher out of the executive team, she was ostracised by her party and founded a new one called the Conservative Democratic Party of Switzerland (PBD). Currently minister of finance, many had predicted her resignation. The recent federal election saw the UDC (SVP) gain significant ground in the 200-seat National Council moving from 54 to 65 seats. 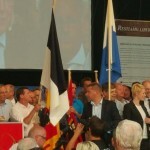 Traditionally the party make up of the Federal Council, or executive branch of Switzerland’s government, has reflected party representation in the Federal Assembly – the National Council and Council of States together. No longer part of the UDC and instead a member a minority party, made her position as a Federal Councillor hard to defend after the recent election shift. According to the Tribune de Genève she told her party of her plans to resign the day following the election, waiting until today to make her decision public. At the press conference she lamented the intense media activity around politics saying “decisions sometimes appear online before I’ve taken them”. She also took the opportunity to praise the collaboration at the heart of government and with Parliament saying “I thank those who have put their party’s policies aside to find compromise”. In a press release this evening the UDC said that it “is ready to take on extra responsibilities”.